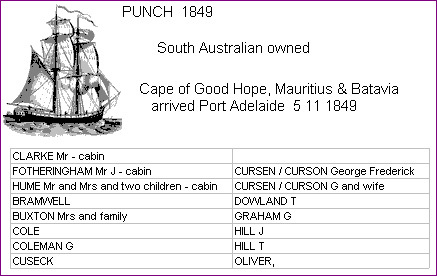 Charles Curson's parents George Frederick and Jane Todd nee Davis arrived in South Australia in 1849 on the ship Punch. With them were sons Henry and George. George Frederick Curson was an engineer, involved in the Paddle Boat Industry at Goolwa, South Australia. 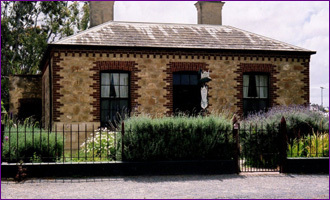 The slip was established in 1864 as the Goolwa "Patent Slip and Iron Works" and was purchased by Abraham Graham in 1867. The first vessel built was the PS Ariel in 1867 and the last in 1884 was the barge Abermarle. Graham built thirteen vessels and in nine cases supplied the engines as well. At its peak the slip employed between 30 and 40 men. This attractive, travertine limestone residence with slate tile roof was built for Mr C F Curson who was manager of Graham's Slip from 1867. NOTE: C.F. should read G.F.
Charles lived in the cottage with his parents George and Jane and siblings while the family was based in Goolwa. Charles Curson, a widower, married Amy Jessy Radford on 4 July 1912 at the Residence of A.J. Radford, Goodwood Park, South Australia. 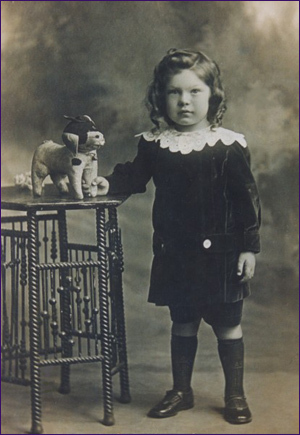 They had a son Laurence Alexander Rex born 3 June 1913 in Wilcannia, NSW. 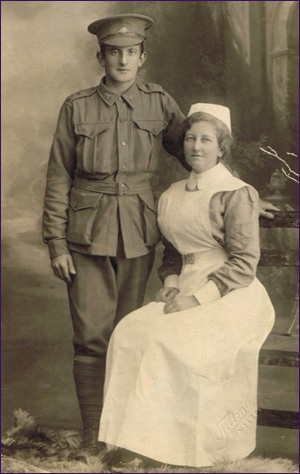 There are a number of letters re son C E V Curson (from first marriage) WWI amongst docs. on Nat Archives War Service Record of son. Living Wilcannia, NSW at the time. 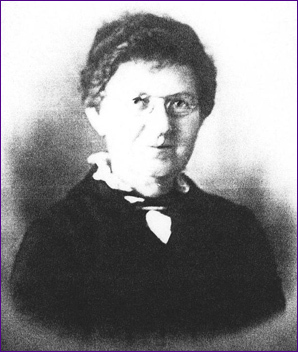 Gertrude Louisa (daughter of Charles and first wife Rosa nee Schuetze) became a nurse and ran a Nursing Home in Camberwell, Victoria. She is shown on the Victorian State Electoral Roll, Commonwealth - Kooyong, State - Boroondara, Subdivision of Camberwell for 1924: Gertrude Louisa, 66 Stewart Street, Camberwell, nurse. 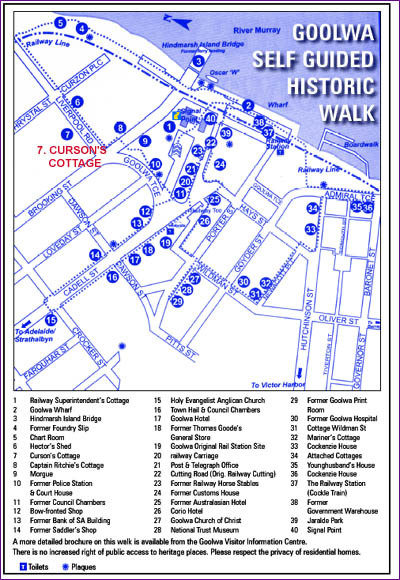 Her father Charles and stepmother Amy Jessy were also shown at this address. Electoral Roll for 1931 - State - Hawthorn, Subdivision of Hawthorn: Gertrude Louisa Curson, 95 Power Street, home duties. Charles Edward Victor (son of Charles and first wife Rosa nee Schuetze) married Rose Thomas in 1917 in Chelsea, England whilst recuperating from War wounds. NOTE: Married by Rev. Cecil Cryer (from War Serv. Record. Nat. Archives - online). Departed London 14 Jan 1919 arr. 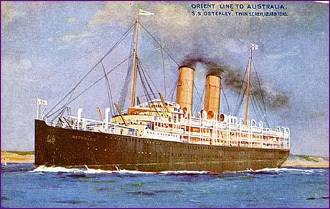 Sydney 28 February 1919 on SS Osterley with other War Brides. (no passenger record held - inf. from husband's War Service Record). He returned to Australia on the Malta, embarked 31/7/1918 disembarking in Adelaide 28/9/1918. He was discharged 8 November 1918. Whilst en route to Australia he was advised that his daughter had died at sea. NOTE: Cpl. Curson was advised of death of his child by Rev Murphy of 13 Fourth Ave East Adelaide 23/10/1919 (child died 12/10/1919) (daughter) - Nat Archives - War Service record. 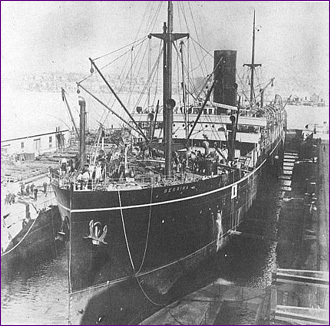 Records show that his wife Rose Curson nee Thomas was travelling on the War Bride ship SS Osterley with the death of their daughter taking place on 12 October 1919. The ship's manifest for SS Berrima shows Charles E.V. Curson and his wife Rose departing Adelaide - they arrived in England on 24 January 1921. 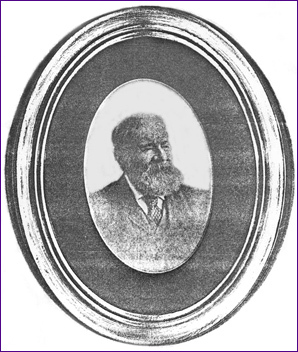 Charles' occupation was listed as Conductor M.T. Charles Curson is listed on Electoral Roll 1924 Camberwell Vic. 66 Stewart St - Engineer - also 2nd wife Amy Jessy - home duties. (address of Charles' daughter Gertrude Curson). He died 29 October 1925 and is buried in the Burwood General Cemetery. His wife Amy returned to South Australia and died aged 72 on 11 August 1952 at Northfield, S.A. Gertrude never married and died aged 55 on 14 November in Victoria. She is buried in an unmarked grave in the Burwood General Cemetery, Victoria with her father. NOTE: Confirmed by staff - ref. A Anderson. 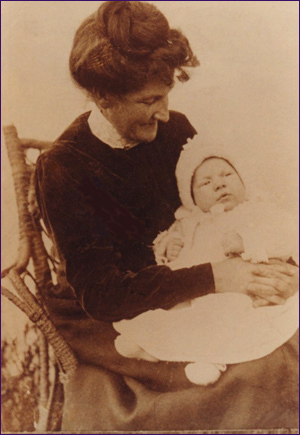 2nd child born to Charles and Rosa nee Schuetze was George Leonard Curson. He married Norah Flannery in 1910 in Wilcannia, NSW. Charles retired due to ill health and they both died in South Australia - George 24 February 1948 and Norah 26 April 1956. They are both buried in St Jude's Cemetery, Brighton, SA. The website showing HEADSTONES IN ST JUDE'S CEMETERY has index entries for CURRON, George & Norah (K2) and CURSON, Thomas & Edith Hannah (D26). No details known re Thomas and Edith. NOTE: could this possibly be Amy Jessy Radford.....? She and Gertrude are the same age. Click here for details and photos of the family of James Cottrell and Mary Jane Hudson nee Sale (parents of Mary Ann Hudson). Click here for details and photos of the family of Gottlieb Wilhelm Schuetze and his wife Mary Ann nee Hudson. Click here for details and photos of the family of Carl Friedrich Schuetze and his wife Emma nee Buermann. Click here for photos of the family of Friedrich Eduard Schuetze and his wife Minnie nee Buermann. Click here for details and photos of the family of Mona Dorothea (Marie Dorothy) Porter nee Schuetze. Click here for details and photos of the family of Maria Caroline Wilke nee Schuetze. 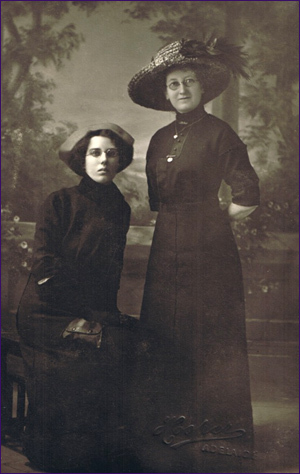 Click here for details and photos of the family of Rosalia Louise Curson nee Schuetze. 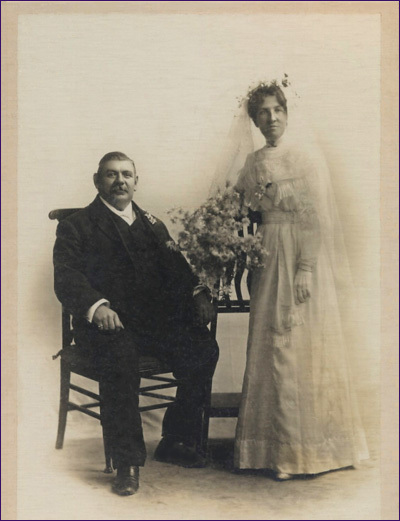 Click here for details and photos of the family of Charles and Amy Jessy Curson nee Radford (2nd marriage of Rosa's husband). A number of Schuetze family photos are courtesy Phoebe Prime nee Schuetze per her son Ken Prime - entrusted to David Wilson. Additional photos courtesy G Turner, A Anderson, N Hausler, S Kortas and various family members.